Royal Palm Dance Party & Show!! Third Saturday Evening of the Month at Goldcoast Ballroom! 6:30 PM – 7:30 PM – Complimentary Dance Class!! 7:30 PM – 11:00 PM – Dance Party & Special Show! with Both Professional & Amateur Partners!! Don’t Miss this Fabulous Evening!! Admission includes the Complimentary class (6:30 pm – 7:30 pm) before the Dance, the Show, Admission to the Dance for the entire evening, pastry or dessert, coffee, and sales tax. Music for the evening Dance includes a well balanced combination of the International Latin and Standard as well as American Smooth and Rhythm styles of dance, as well as West Coast Swing, Hustle, Merengue, and Other Social Dances. * Florida Law requires us to collect 6% FL Sales Tax from our Patrons on all Prices of our Social Dances. For your convenience, we include the Sales Tax in our Total Admission Amounts (as stated above) to save everyone the bother of dealing with pennies for Sales Tax at Admission. Thank you for your expressions of appreciation & understanding. This means that the Regular Admission to our Saturday Evening Social Dances is $15.09 (price to Goldcoast) + $0.91 (6% Sales Tax to State of FL) = $16.00 Total. The discounted Admission Price for USA Dance Members who present their membership card on USA Dance Night (usually the third Saturday night of the month) is: $14.00 Total (including 6% FL Sales Tax). 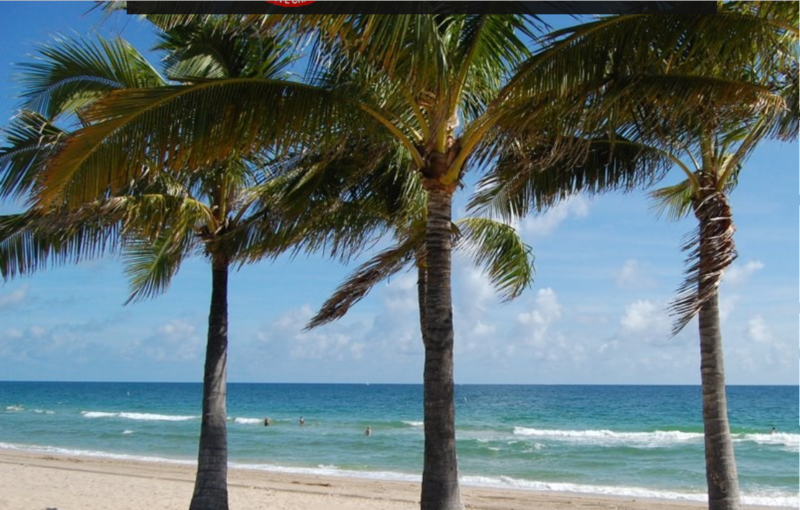 The Admission Total includes the Complimentary dance class before the Dance, admission to the Dance for the entire evening, the Show, pastry or dessert, coffee, and 6% FL Sales Tax. Admission for the Saturday Evening USA Dance Monthly Dance includes the COMPLIMENTARY Dance Class (6:30 PM – 7:30 PM) — included with paid admission to the Dance. Check our Calendar for details on the class being offered. Don’t miss it!! 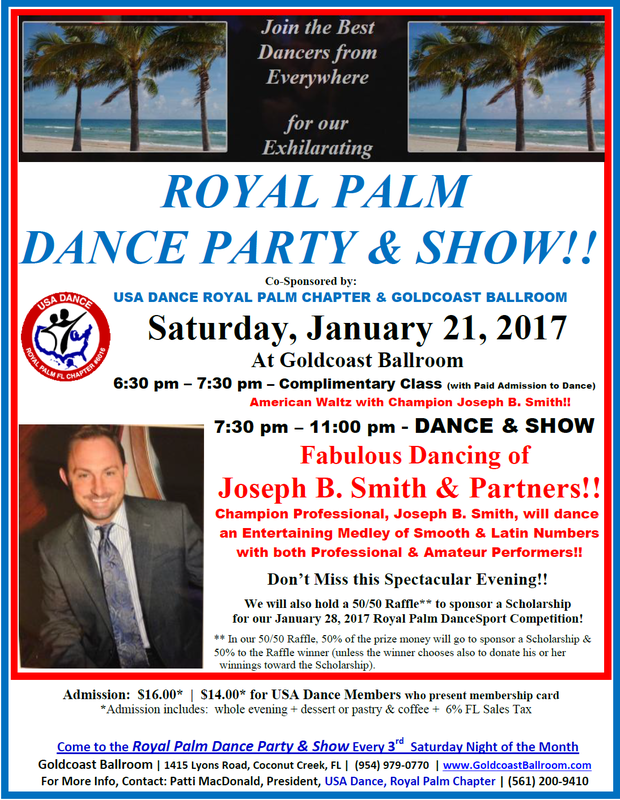 Usually, on the Third Saturday of each month, the USA Dance Royal Palm Chapter monthly Dance & Show is combined with our regular Saturday Night Social Dance. USA Dance is the official United States association for amateur ballroom dancers. Some of the best amateur dancers from all around come to USA Dance Monthly Dance nights! Both couples and singles are welcome. Join the Best Dancers from Everywhere for our Exhilarating Royal Palm Dance Party & Show – the Third Saturday Evening of the Month at Goldcoast Ballroom! « Spectators Welcome!! 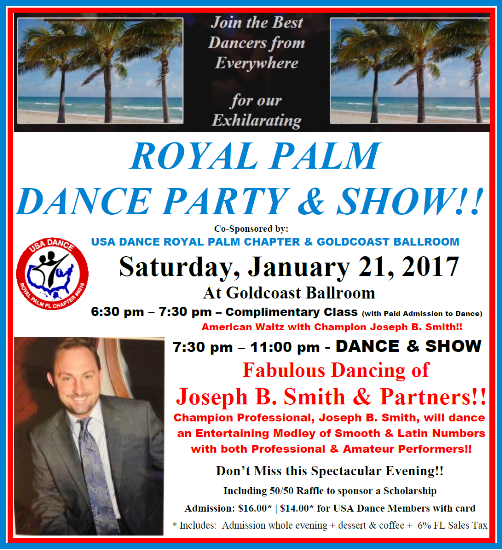 – Royal Palm DanceSport Competition – All Day January 28, 2017 at Goldcoast Ballroom!